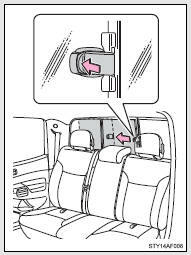 The back window can be opened and closed using the lock release lever. Push the lock release lever and slide the back window. Make sure that the back window is securely closed after closing it. Keep the back window closed. This not only keeps personal belongings from being thrown out, but also prevents exhaust gases from entering the vehicle.